Scene of the Blog Featuring Risa of Breadcrumb Reads! This week's featured book blogger is a teacher by profession, a former editor at a publishing house, and a stay-at-home mother with a young son. Risa is from India, and she doesn't accept books for review because "My reading time is very limited and I prefer to spend it reading all the books I have wanted to read for ages or would like to add to my book collection." In her blog Breadcrumb Reads Risa talks about those books she reads. She's reminded me of many classics that I've read and she's introduced me to many authors I've never heard of. If you've never visited Breadcrumb Reads, I hope you take this opportunity to do so, and please say hello to Risa while you're there! If you're visiting from Risa's blog, welcome! I'm glad you've stopped by to take a look at Risa's blogging space. If you'd like to see the photo in a larger size, all you have to do is click on it, and it will open in a new window. If you'd like to see more blogging spaces from former participants, please click on the Scene of the Blog tab at the very top of my header. Risa is about to give us a tour, so let's not keep her waiting! 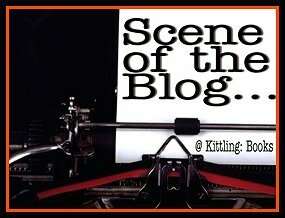 I wasn't aware until Cathy contacted me that there was a feature called "Scene of the Blog". I've spent some time since then going through some of the feature posts, and it's been lovely reading through and looking at pictures of other bloggers' work spaces. My work space is in a cozy little corner of the dining room. Beside it is a window that looks into our balcony and the green open plots beyond. The walnut- coloured desk you see was something I fell in love with the moment I spotted it at a furniture store. My husband and I had not really intended buying a study table for a while yet when we walked into the store. But the moment he saw me gushing over it he bought it for me on the understanding that I would definitely use it. Well, duh! Of course I was going to use it! Until we got this I had to keep carting my laptop all around the house! And then, there was the struggle to keep my son from pulling the wires and tripping all over the place. Now my study table is out of everybody's way. It took some time for me to find my cozy nook. But after three months of shifting it around, we finally settled for the current place. My husband has been looking to move it again, but I'm quite adamant to have it where it is! The only disadvantage is that I don't get too much of the fan. But it doesn't really bother me...much. In the middle rack I keep a few show pieces (this is my dining room after all! :D), most of which I picked up on our recent trip to Malaysia. You can't see it in this photograph, but I keep a little green frame with a cute picture of my son when he was two months old, at this end of the rack. Right on top you see our printer balanced rather precariously and a desk-top calendar with pretty paintings of Indian scenery. I don't use the rack below the desk as yet since it would then become the scene of my little one's mischief. A place of one's own is very important. I really enjoyed your telling us about finding the desk, buying it, and then the effort to find the right place for it. I know that many of us have had similar experiences. Thank you for allowing us this glimpse into your creative spaces, Risa. We certainly appreciate it! I really like your desk, Risa. Now I'm off to visit your blog. So nice to see you here, Risa. I have enjoyed your blog for a while now and it's interesting to see your work space - thanks for sharing! What a lovely desk- much nicer than the gray monolith I have. Whew! I've had a very busy week...sorry for not having stopped in before this! @Alex - Hi! :D YOu think so?...I love my corner. My husband looks at it every once in awhile with a speculative gleam in his eye and I have tell him "that's mine!" lol! Risa, I really enjoyed having you as a guest!